How can it be that 50 years after the passage of the Civil Rights Act, our institutions of higher education have still not found ways of reducing the higher education gaps for racial and ethnic groups? That is the question that informs and animates the Equity Scorecard model of organizational change. It shifts institutions’ focus from what students do (or fail to do) to what institutions can do—through their practices and structures, as well as the actions of their leaders and faculty—to produce equity in outcomes for racially marginalized populations. Drawing on the theory of action research, it creates a structure for practitioners to become investigators of their own institutional culture, to become aware of racial disparities, confront their own practices and learn how things are done on their own turf to ask: In what ways am I contributing to equity/inequity? The Equity Scorecard model differs significantly from traditional approaches to effecting change by creating institutional teams to examine and discuss internal data about student outcomes, disaggregated by race and ethnicity. The premise of the project is that institutional data acts as a powerful trigger for group learning about inequities in educational outcomes, and that the likelihood of improving those outcomes increases if the focus is on those things within the immediate control of the participating leaders and practitioners. 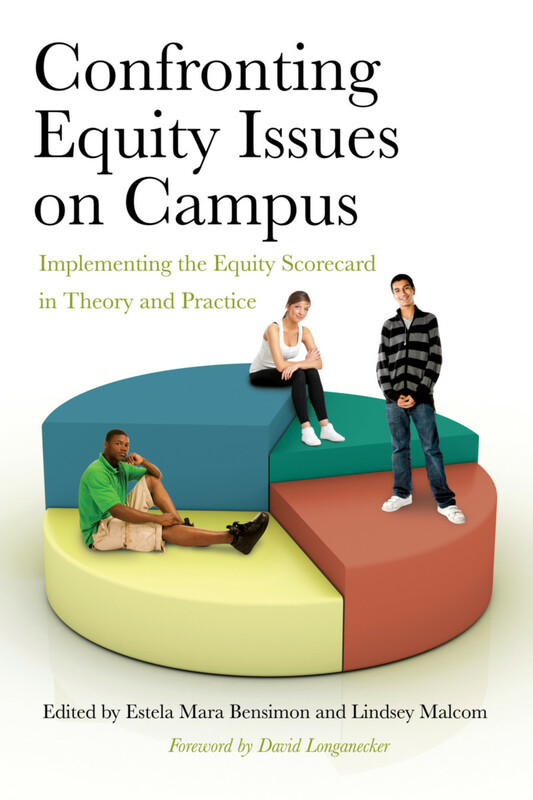 Numerous institutions have successfully used The Equity Scorecard’s data tools and processes of self-reflection to uncover and document the behaviors and structures that lead to failure to retain and graduate students from diverse racial and ethnic backgrounds with a history of unequal opportunity; and to create the climate for faculty and staff to take ownership of the issues and develop sustainable practices to eliminate racial disparities in academic performance. The Scorecard can be used at a small-scale to analyze individual courses or programs, as well as broader institutional issues. This book presents the underlying concept of funds of knowledge for race-conscious expertise that informs this process, describes its underlying theories; defines the attributes needed to achieve equity-minded practice; demonstrates, through examples of implementation, what different institutions have learned, and what they have achieved; and provides a blueprint for action for higher education as a whole. For college leaders, instructors and support staff who feel the pressure—moral or otherwise—to close the racial equity gap that their institutions produce year after year, this book provides the structure, knowledge and tools to do so. It is also of value to scholars and students of higher education who have an interest in the study of organizational change. "This volume examines how colleges and universities are using the Center for Urban Education's Equity Scorecard to create racial equity on campus. With in-depth examinations of the Equity Scorecard process as well as reflections from practitioner teams and researchers, the book is a testament to the role thoughtful data assessment can play in generating more racially equitable outcomes for students. The book calls educators and administrators to take personal responsibility for their roles in moving from deficit model to an equity model, and provides helpful context for anyone currently using or considering the scorecard as a tool for change." "Writings by researchers at the University of Southern California's Center for Urban Education and partners in the center's Equity Scorecard project; case studies include an effort to improve student outcomes in mathematics at Los Angeles City College." “Confronting Equity Issues on Campus teaches us a valuable lesson. It shows us that inequities are more central to the ways higher education institutions operate than how students participate. Through the dedicated work of editors Estela Bensimon and Lindsey Malcom and their equally committed chapter authors, the book highlights the importance of realizing and rectifying institutionalized inequities that have become an accepted way of doing business in higher education in the United States. By detailing how methods, practices and tools such as the Equity Scorecard have been used to address institutional inequities, readers see how to engage in reflective dialogues about inequities that reside deep within the higher education system. Many ideas presented in this book have been central to the work of the Office of Community College Research and Leadership (OCCRL) at the University of Illinois at Urbana-Champaign and influential in developing Pathways to Results, an outcomes and equity focused method for engaging state policy leaders, practitioners, and researchers in using student outcomes results to improve pathways for diverse learners to transition from secondary to postsecondary education and employment. For those beginning on the equity journey, this book presents a valuable resource to shape an equity initiative, and for those who have experience, the book gives renewed motivation to continue the hard work required to change higher education for the better – forever." “The accountability mechanisms imposed by policy makers frequently fail to provide insight where it is most needed – in the classroom and in the other important interactions between practitioners and students. The methods detailed in Confronting Equity Issues on Campus bridge that gap, fueling the feedback loop that helps faculty and administrators test their assumptions, revise practices, and improve student outcomes. The book’s focus on providing practical solutions rather than sociopolitical analysis is refreshing, and is enormously useful in addressing a vital, pressing issue." “As the institutions of both choice and necessity for our nation's Latino and African American students, community colleges who are serious about moving towards equality of outcomes must engage in continuous work that embraces classroom design, co-curricular support services, and organizational policy. Santa Ana College's equity work has been enormously advanced by the tools, the value-added strategic thinking, and the dignity accorded to our segment by the Center for Urban Education over the last several years. With the Equity Scorecard, among other initiatives, they have helped us engage uncomfortable truths, apportion precious resources to areas where we can maximize student impact, and continuously apply what we are learning to the academic and organizational design of our college. I celebrate the release of this volume knowing its significance to the national community of advocates and change agents whose work will be enormously advanced by the practical and theoretical insights and tactics it features." “Why do students of color fail to thrive under our current system of higher education? That’s the question this book asks. And in answering that question, it provides evidence from action research not just on causes, but on solutions. Delineating how we can reduce equity gaps, it also shows how we might use American higher education as a tool to radically transform our culture into one that truly values equality, in word and in deed. This book will serve a variety of stakeholders. It stands as a guide for campus administrators and faculty who see the need for change but haven’t yet found a way to make it happen. It provides aid to those who have already made the commitment to move forward but require help in convincing their professional colleagues of the need to do so and their institution’s ability to do so. It offers hope and valuable research to race theorists and others interested in the scholarship of equality and inequality. Estela Mara Bensimon is a professor of higher education and co-director of the Center for Urban Education at the USC Rossier School of Education. Her current research is on issues of racial equity in higher education from the perspective of organizational learning and sociocultural practice theories. She is particularly interested in place-based, practitioner-driven inquiry as a means of organizational change in higher education. Dr. Bensimon has held the highest leadership positions in the Association for the Study of Higher Education (president, 2005–2006) and in the American Education Research Association—Division on Postsecondary Education (vice president, 1992–1994). She has served on the boards of the American Association for Higher Education and the Association of American Colleges and Universities. Dr. Bensimon was associate dean of the USC Rossier School of Education from 1996 to 2000 and was a Fulbright Scholar to Mexico in 2002. She earned her doctorate in higher education from Teachers College, Columbia University. Lindsey Malcom is an assistant professor of higher education administration in the Graduate School of Education and Human Development at the George Washington University. She received her bachelor’s degree from the Massachusetts Institute of Technology, her master’s degree from the California Institute of Technology, and her PhD in Education from the University of Southern California. Lindsey’s scholarship focuses on broadening participation in science, technology, engineering, and mathematics fields.